I don’t talk about my smoothie imbibing much on the blog. That’s because it’s super boring. Unless you consider a nightly smoothie packed with kale, spinach, pineapple, and chia to be an exciting thing. Then by all means, come on over and I’ll make extra. Seriously though, I love those smoothies and they make me feel good about getting some greens in my body even if I’ve had an otherwise subpar day nutritionally. If i had the time/energy/motivation I’d totally drink them in the morning, but I fear the noise of the blender at 5:30 a.m. would drive me to the edge of insanity. I’m already close every day when I have to get out of bed. Now that I bored you by talking about a topic I just called totally boring, let’s talk about a smoothie that’s a littttle bit more fun. Smoothies with vodka. While you probably wouldn’t serve a kale smoothie at your summer party (unless you would? 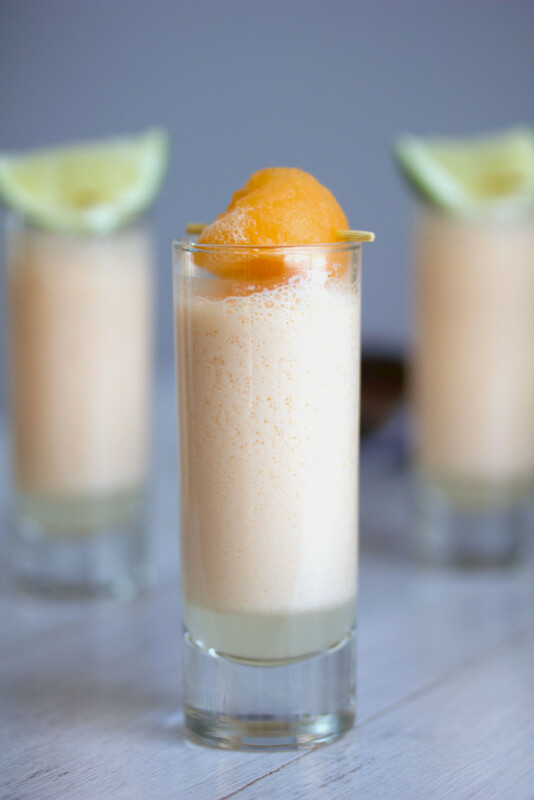 In which case, I kind of want to come to your party to see what it’s all about…I’m also a little afraid), you’d totally serve a Cantaloupe Boozy Smoothie Shooter. 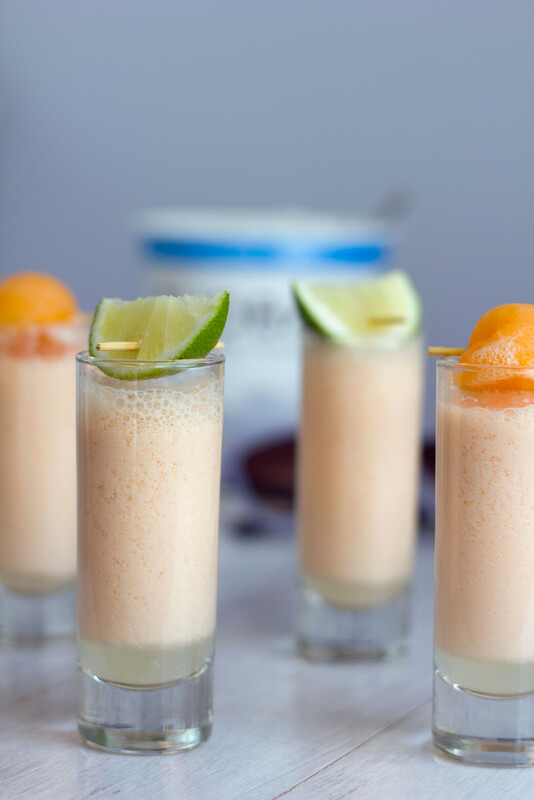 These take about 5 seconds to make and are the perfect summery drink, especially for someone who wants “just a taste.” And yes, they involve alcohol! 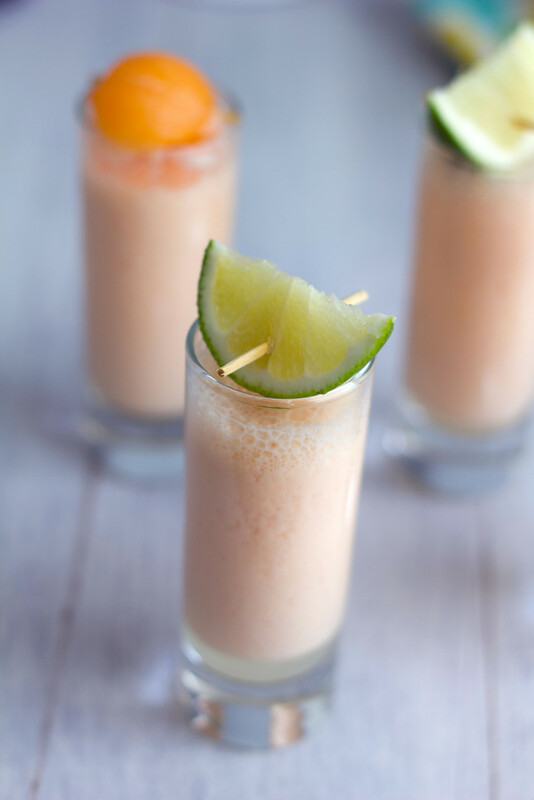 To make the boozy smoothie shooters, simply put the ingredients in the blender! I used 3 C chopped cantaloupe, 1 T freshly squeezed lime juice, 1/2 C non-fat Greek Yogurt, and 2 oz. vodka. I put the first three ingredients in my VitaMix and blended well, until smooth, and then added the vodka for another quick blend. Divide the smoothie among shooter glasses. I use a 2.5 oz. version from Libbey (they’re on sale here!) and got about 12 shooters total. Then I sliced some limes and used my cookie scoop to make some melon balls. I put them on little toothpicks and used them as garnish. Line these boozy smoothies up on a tray or keep them in a bed of ice and serve them to your summer party guests. They’re a little bit tropical and most definitely fun. Yes, I admit I was a little apprehensive to mix vodka with yogurt. I wasn’t sure if that was socially acceptable. But I did a little research and found that it’s totally done at some of the hippest bars. Isn’t this just an invitation for me to open up a boozy smoothie bar?? I think so! 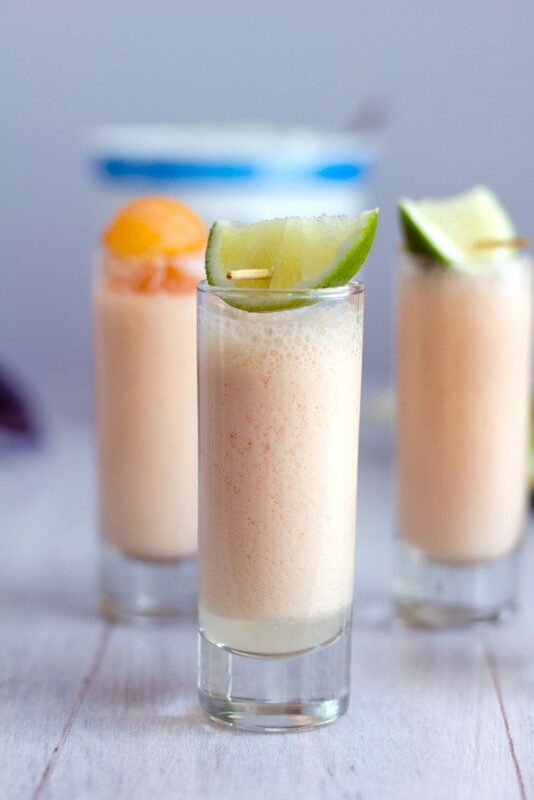 I’m a huge fan of the boozy shooter for summer parties idea. Sometimes you don’t want to walk around with a big drink (carrying a drink and a plate of food while also trying to hold conversations is my worst nightmare) and you’d rather take a couple sips and then grab another drink when you’re ready. Obviously these smoothie shooters don’t have a huge amount of alcohol in them and you could totally add more if desired, but remember, they’re just a few sips! Also, if you wanted to leave the vodka out (SIGH), you’d still have a really delicious cantaloupe smoothie. Believe it or not, this is the first year that I’ve really gotten into cantaloupe. I’ve always been more of a honeydew girl, but cantaloupe seems to have gotten more juicy and delicious this year. Why is it so much better when you chop your own than it is in almost any fruit salad you get from a restaurant or anywhere else? Same goes for watermelon. I may have to add this to my smoothie rotation. Maybe I’ll forgo my Friday night kale smoothie for one of these instead? Or should I try adding vodka into my kale smoothies? Hmmm probably I should leave those ones alone otherwise it kind of defeats the purpose of the whole trying to be healthy thing. UGH. 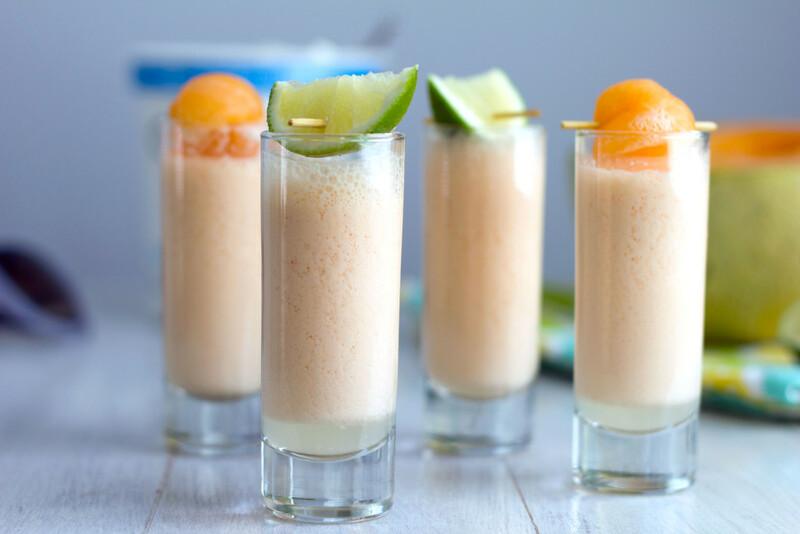 Now that I know boozy yogurt shooters can be a thing, I’m most definitely going to try this with more fruits… Already dreaming up a little watermelon and rum! Are you a smoothie drinker? What about alcoholic smoothies? 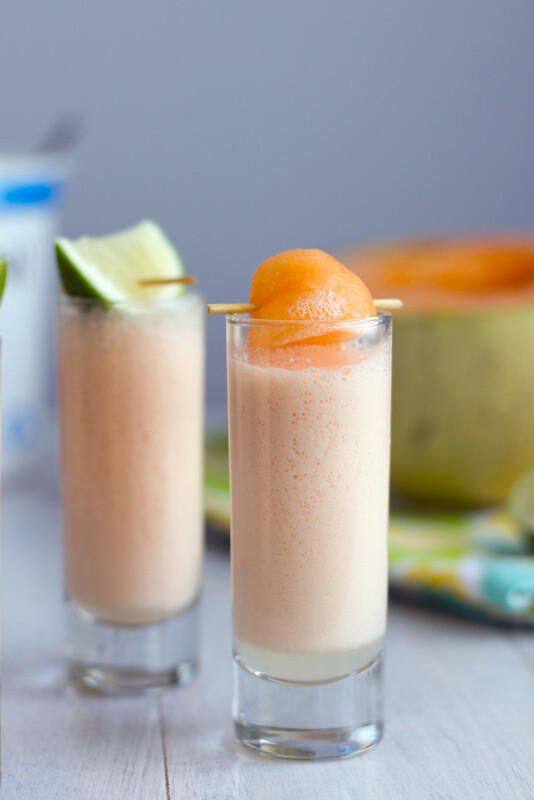 These cantaloupe boozy smoothie shooters are the perfect party sippers. Made with a few simple ingredients you don't often find together, they have just a little vodka kick. 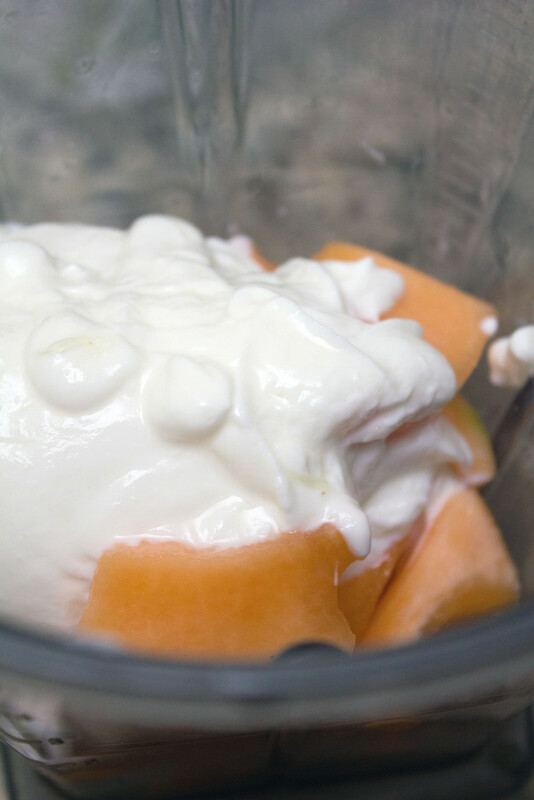 Put cantaloupe, lime juice, and Greek yogurt in blender and blend until smooth. Add vodka and blend for another 2 seconds. Divide smoothie into about 10 2.5 ounce smoothie glasses. Garnish with cantaloup balls and lime slices. 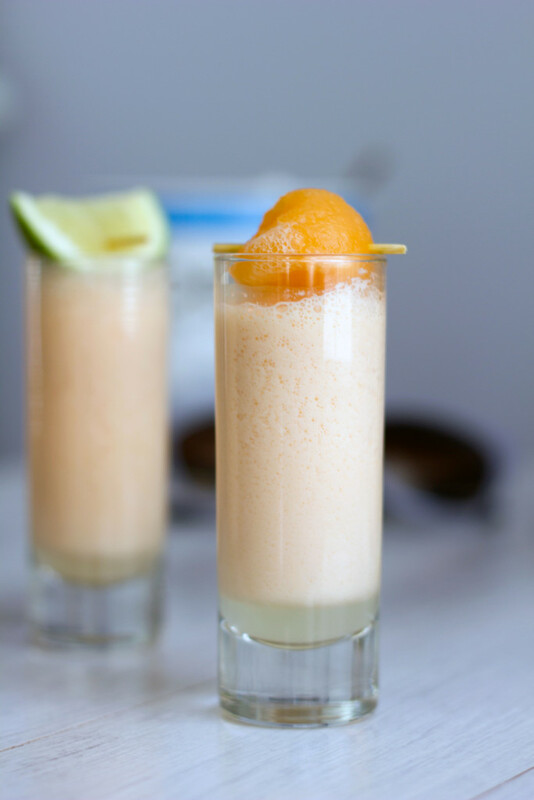 19 Responses to "Cantaloupe Boozy Smoothie Shooters"
These are so cute! I love the idea of a boozy smoothie (minus the kale)! This is SUCH a great idea, Sues! I’m loving the looks of these shooters. SO creative and sounds so refreshing, especially for happy hour! What a fun treat! They look so refreshing. I love love this idea!! They look so cute and vodka with cantaloupe – perfect friday night drink!! Oh man, I am totally trying these. I love that you used cantaloupe – it sounds so refreshing! Your photos are such a delight! Makes me want to reach right in and drink one of your vodka smoothies! Now that’s MY type of smoothie! These are so pretty and adorable! Love the cantaloupe – sounds so refreshing and delicious! These shooters are so adorable! I cannot make melon balls to save my life (even with a melon baller) so I’m super impressed. I’m also super impressed you make a nightly smoothie, that’s just amazing! These look too good, so creamy and flavorful, the perfect summer treat with my favorite fruit! Yum! 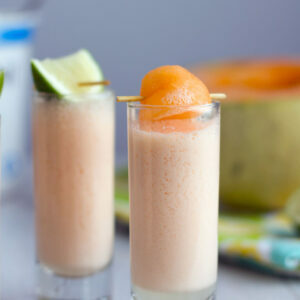 Smoothie shooters…they sure look great…I love the idea…and yes, cantaloupe just sound perfect…I love the color of it. Perfect adults smoothie! I love their beautiful pale color as well! Never tried a boozy smoothie before! Looks like a delicious treat for this time time of year. Friday night kale? Seriously?! Girl, you gotta stop that. Friday night is definitely for boozy shooters. These look so elegant, too! First I thought, glittery flats, yesss… then you had me at boozy smoothie! Great blog.